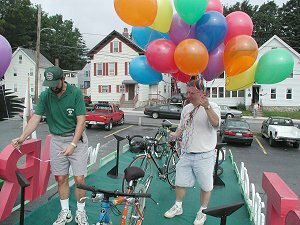 Assabet River Rail Trail, Inc.
Our September meeting will be special event, featuring a history of the trail. Refreshments will be served and the public is invited to attend! New ARRT Website http:www.arrtinc.org/ Thanks to Peter Jonietz and his employer Viatech, Inc., for setting up, sponsoring, and funding our new website. Look for arrtinc.org on bill boards and other communiqués. ARRT Project Planning Effort in High Gear, starting in Acton ... In Sept. & Oct., ARRT volunteers Martin Graetz and Tom Kelleher, in concert with Town Planner Roland Bartyl and representatives from the other ARRT Towns, will be working with Earth Tech to develop the strategic plan for implementation of the entire, 5-Town ARRT. ... and continuing in Maynard: Thanks to Town for securing $2K match to fund Earth Tech project planning. Two ARRT volunteers from Maynard still needed to participate. Please call Jeff at (978) 464-5581 for details. Intermunicipal Agreement progressing Draft of document has been reviewed by all 5 Town Councils, been revised, and is back to Selectmen's/Mayor's Offices for signature. Three cheers to Michelle Ciccolo, Hudson Administrative Assistant, for moving this along. Notice to, Proceed.... not progressing Please renew lobbying efforts to get EOTC to issue our Notice to Proceed and thereby make available our 1998 ISTEA acquisition funding. 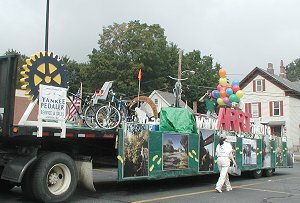 Sept. 3 Marlborough Labor Day Parade Features ARRT Float Sponsored by Marlborough Rotary Club, and with a big push by George & Donna Mongeau of Hudson, Steve Hitner of the Marlborough Sir Speedy, Bob Misner of the Yankee Peddler, A & P Trans., and Space Age Electronics,... the event is reviewed on our web site at www.ARRTinc.org/. 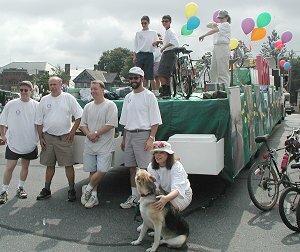 Thanks also to Ellen Greenwood, David Hecht, Duncan Power, Tom Kelleher, Nick & Cindy Kofos, & George Johnson for your construction and parade participation. Hudson Receives TDM Grant - $89K - FY01 EOTC funds Park & Ride facility at juncture of the ARRT and the Wayside Trail (at Wilkins St., or Rte. 62, in Hudson). Funding for land acquisition and 25% design work for segment from Assabet River bridge, east to the Park & Ride at Wilkins St. Next stop,... Stow! Nov. 20, 2000 - Hudson Town Meeting to consider $50K to take Assabet River bridge to Park & Ride trail segment from 25% to 100% design. Meeting starts at 7:30 p.m. at the High School Auditorium. Please plan to support. Brigham Estates IH, in Hudson to be considered by Conservation Commission on 9-21-00 and by Planning Board on 10-3-00 Subdivision is proposed along 1300 linear feet of the ARRT just north of the Connector Road. Development proposal needs ARRT volunteers scrutiny and comments, especially during the public hearing process. Call Jennifer Burke, Hudson Board & Committee Coordinator at (978) 562- 9963 for information & mtg. times. Bill Board to Advertise the ARRT Not to be outdone by parade floats, the Hudson Selectmen recently voted approval of a revocable license with AK Media for rights to advertise Town business on the bill board along the ARRT in front of PC Creames in Hudson. (The billboard is on Town property; AK Media was renewing their lease.) Advertising specialists and Graphic artists are needed to help design a series of bill board signs for promoting the ARRT, to run starting in Nov. or Dec. of this year. Call Michelle at 562-9963 for details.